One excellent area for using Google tools is in music education. A lot of times it is common to focus on "The Big 4" of language arts, math, science, and social studies, when exploring technology tools for learning. However, it is important to see how technology can be integrated into all subject areas and skills. 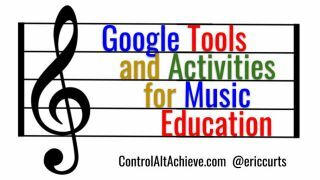 One excellent area for using Google tools is in music education. Technology can help students create their own music, as well as explore and understand musical concepts that may be difficult to visualize otherwise. In this blog post we will take a look at many tools from Google, or that work with Google, that can be used for teaching, learning, and creating with music. These include Chrome Music Lab, Song Exploder's Inside Music, AI Duet, Groove Pizza, Mix Lab, Flat, and many more! See below for details, links, and descriptions for all of these tools. Chrome Music Lab is a collection of 13 interactive "experiments" that let users create, play, and learn with a wide range of music concepts. Experiments include Song Maker, Rhythm, Spectrogram, Chords, Sound Waves, Arpeggios, Kandinsky, Melody Maker, Voice Spinner, Harmonics, Piano Roll, Oscillators, and Strings. These activities are also cross-platform, working on laptops, tablets, and phones. I recently did a blog post where I went into details on each of the 13 tools in Chrome Music Lab. You can get all of those details here: "Learning Music, Art, Science, Math and more with Chrome Music Lab"
You can begin with premade "Specials" to see what can be created and then modify those as desired. Or you can start with a "Plain" pizza where you make your rhythm from scratch. You can add beats to three different tracks. You can make up to four groove pizzas at a time that will play one after the other. You can change instruments including "Rock", "Techno", "Afro-Latin", "Hip-Hop", and "Jazz". You can adjust the "Volume", "BPM" (beats per minute), the "Swing" (to slightly offset some of the beats), and the "Slices" (number of beats). When done you can even download your creation as a .WAV file. If you click on the "Angle" button, the angle measurements for each vertex will be displayed. This can be a helpful way to teach or reinforce the concept of the sum of the interior angles of a polygon. You can also click the "Polygon" button to shade in the shapes on your pizza. This can tie into the study of different polygons. Finally, fractions can be visualized using the groove pizza, as well as the option to change the number of "Slices" which can be applied to comparing fractions and equivalent fractions. Or you can just say "Hey Google, talk to MixLab" when using Google Assistant or a Google Home. Now you can simply speak to Google to add different sounds to four tracks including "Guitar", "Drums", "Bass", and "Keyboard". You can say things like "Play me a funky bass" or "Add some jazz drums" or just "Play me something". If you like what you create, you can share it with others by clicking "Share this mix" in the bottom right corner. Start playing my clicking on the on screen musical keyboard. Or use your computer keyboard with the "A" row being the white keys of the keyboard, and the "Q" row being the black keys. The computer will then play a duet with you based on what you played. Choose a song you want to hear. The song will play with each track broken out. You can click and drag to move around the scene, and then click on any instrument to turn it off or on. This works on your web browser, but can also be experiences with a VR headset or on your phone. Choose where you want to get your sample music/sounds from including your microphone, sample provided sounds (sax, guitar, violin. etc. ), a playable on-screen piano, or an uploaded audio file of your choice. Choose which visualization you wish to use including Hilbert Scope, Spectogram, Waveform, Oscilloscope, and more. You can also turn on the option for "Grid and Notes" which will display the actual notes as the music is playing. Position your body so your webcam fits you within the outline on the screen. When you are in position the orchestra will start and you can conduct. The speed you move your arms controls the speed the orchestra plays. Moving your arms up or down makes the orchestra play louder or softer. Moving your arms from side-to-side controls which sections of the orchestra are playing. The Google Arts and Culture site is a massive collection of photos, primary source documents, videos, VR experiences, and more, all dedicated to cataloging and exploring human history, art, music, and more. For music, one particularly useful collection is the "Performing Arts" section of the site. Another music composition tool is the Flat website, as well as the Flat add-on for Doc and Slides. The website at https://flat.io is the full version of the tool, which allows students to collaboratively write sheet music with a wide range of instruments. There is a free version, a paid version, and an educational version (https://flat.io/edu) which integrates with Google Classroom. I tested out the free version which lets you create 15 scores with over 100 instruments. Install the Flat add-on for Docs or the Flat add-on for Slides. Launch the tool by clicking "Add-ons" then "Flat" then "Insert Musical Snippet". You can now compose your musical snippet using the notes and menu items. Click the play button as needed to hear what you have created. Click "Insert" when done to add the snippet to your Doc or Slide as an image. Later you can play back the music by selecting the image and re-opening the add-on. Soundtrap is a very powerful, but very easy to use, music composition and collaboration tool. Although it is not from Google, it works well with you Google account. You can log in using your Google account, and if you choose to purchase the educational version, it integrates with Google Classroom (and has lots of other benefits). Open and existing project or create a new one. On the editor screen you can now add and edit tracks for your composition. You can add a track by choosing from the large collection of pre-made loops with many different instruments. Or you can add a track by recording it yourself with the on-screen keyboard, again using hundreds of instrument sounds. You can invite collaborators to work in Soundtrap with you on your creation. When done you can export your music in several different formats. Standing up in front of a class or group of students to sing a song or play an instrument can be a stressful situation for some students. It is very easy for their nerves to get in the way so that the student’s performance is a poor representation of what they really know. One option to help with this is to allow students to record themselves with a screencast. The student will be much less nervous you will get a more accurate measure of what they know or can do. The student will likely do the recording multiple times to get it perfect, encouraging lots of practice and repetition. The student will likely gain confidence, as the screencast serves as a stepping stone to presenting live eventually. There are many excellent screen recording tools you and your students can use. One of my favorites is the Screencastify Chrome extension, which can be installed from the Chrome Web Store here. Music is a powerful tool for student learning and expression. Technology can provide many ways to enrich and extend this experience. If you have other technology resources that are helpful in teaching and learning with music, please consider sharing them in the comments below.